Tart, sweet and reminiscent of late summer flavors, the perfect tea for a woman about to pledge herself to an underworld king. As a little girl, Persephone promised to marry a faerie, but only if he could make seven of her very childish dreams come true before her thirtieth birthday. 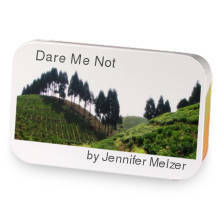 Persephone's Promise has hooked up with Dare Me Not. Love Persephone's Promise? This is just one of 5 teas in this fandom. Check out the whole series.